Fig 1. 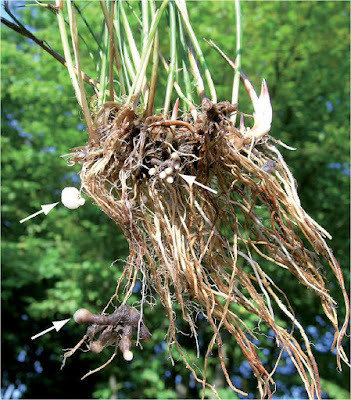 Portion of a tussock of Juncus articulatus with root galls caused by Entorrhiza casparyana (arrows). Note that the older segments of the galls are brown-colored while younger parts are whitish (tips). Entorrhiza is a small fungal genus comprising 14 species that all cause galls on roots of Cyperaceae and Juncaceae. Although this genus was established 130 years ago, crucial questions on the phylogenetic relationships and biology of this enigmatic taxon are still unanswered. In order to infer a robust hypothesis about the phylogenetic position of Entorrhiza and to evaluate evolutionary trends, multiple gene sequences and morphological characteristics of Entorrhiza were analyzed and compared with respective findings in Fungi. In our comprehensive five-gene analyses Entorrhiza appeared as a highly supported monophyletic lineage representing the sister group to the rest of the Dikarya, a phylogenetic placement that received but moderate maximum likelihood and maximum parsimony bootstrap support. An alternative maximum likelihood tree with the constraint that Entorrhiza forms a monophyletic group with Basidiomycota could not be rejected. According to the first phylogenetic hypothesis, the teliospore tetrads of Entorrhiza represent the prototype of the dikaryan meiosporangium. The alternative hypothesis is supported by similarities in septal pore structure, cell wall and spindle pole bodies. Based on the isolated phylogenetic position of Entorrhiza and its peculiar combination of features related to ultrastructure and reproduction mode, we propose a new phylum Entorrhizomycota, for the genus Entorrhiza, which represents an apparently widespread group of inconspicuous fungi. Members of the Fungi sensu Hibbett et al. infecting roots with regularly septate coiled hyphae. Septal pores without Woronin bodies or membrane caps. Remarks: Only the genus Entorrhiza C.A. Weber is included. Entorrhizomycetes was proposed by Begerow et al. 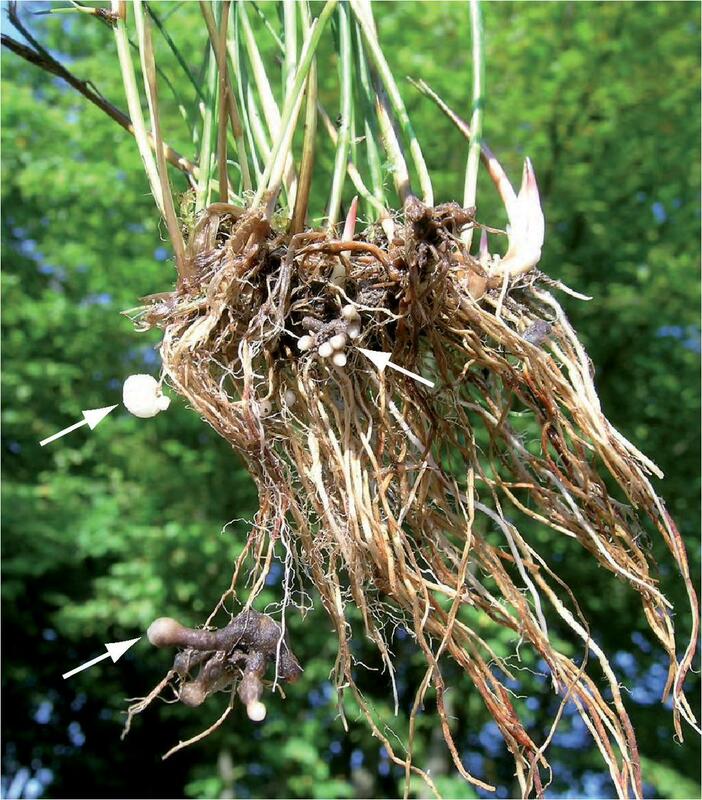 ; Entorrhizomycetidae, Entorrhizales, and Entorrhizaceae were established by Bauer & Oberwinkler in Bauer et al.. The species of Entorrhiza infest members of Cyperaceae and Juncaceae worldwide. The origin of the Dikarya (and thus also of the Entorrhiza lineage as its assumed sister group) was roughly dated at around 600 million years BP, more or less parallel to the first appearance of primitive land plants, whereas the origins of the known extant host groups of the Entorrhiza clade, the core Poales, has been dated at around 100 million years BP. Because of this discrepancy, we hypothesise that the known species of the Entorrhiza clade and their respective host spectra reflect only the tip of the iceberg of a much broader group, comprising perhaps also the lower land plants. Because of the lack of any aboveground signal of infection, the host plants are difficult to detect in nature. There also might be members of the Entorrhiza clade that do not cause galls on the roots. To test this hypothesis, we are currently developing specific primers for an efficient molecular detection of this fascinating group of root-colonizing fungi. For the phylogenetic placement of Entorrhiza two alternative hypotheses are most plausible: (i) Entorrhiza is the sister group to the rest of the Dikarya, or (ii) Entorrhiza is the sister group to Basidiomycota. The first topology was inferred in our phylogenetic analyses of a five-gene dataset. It is consistent with the interpretation of the Entorrhiza meiosporangium as representing the ancestral meiosporangium of Asco- and Basidiomycota. The second scenario, which is in agreement with ultrastructural similarities, could not significantly be rejected in ML analysis of our five-gene dataset. Based on its peculiar combination of morphological features we therefore propose, a new phylum of root-colonizing fungi, the Entorrhizomycota, which is compatible with both alternative phylogenetic positions discussed in this work.